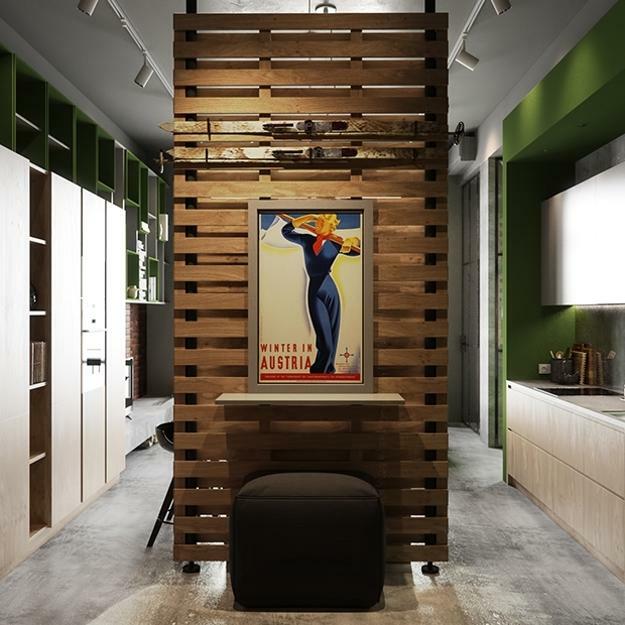 Modern apartment ideas in industrial chic style are a popular trend. 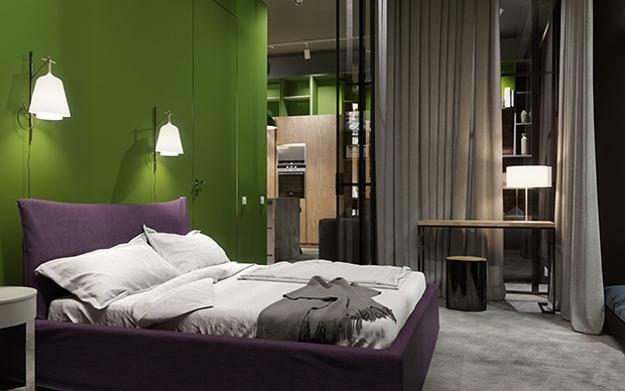 Lushome presents this bright studio apartment designed for a young couple who love skiing in Europe. 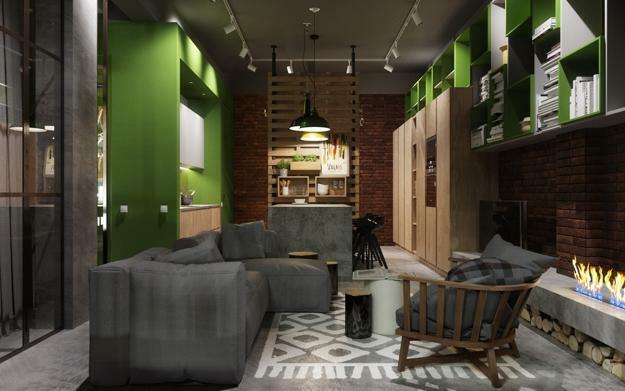 Modern interior design blends the industrial chic style with alpine motives and brightens up the home interiors with accents in green color. 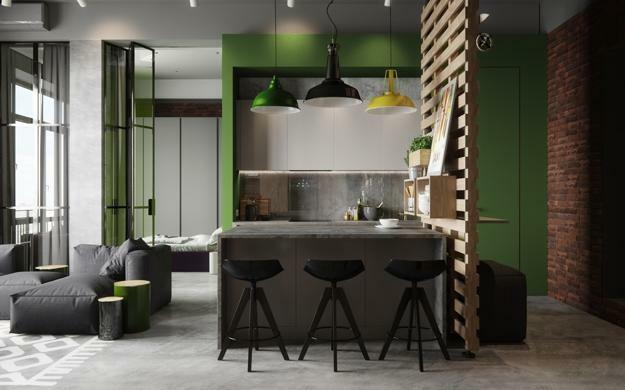 Large windows provide plenty of natural light, and the open plan interior design create a sense of freedom, blending the industrial chic style with comfortable room furniture, and concrete look with freshness of accents in green color. Concrete structures emphasize the industrial style. 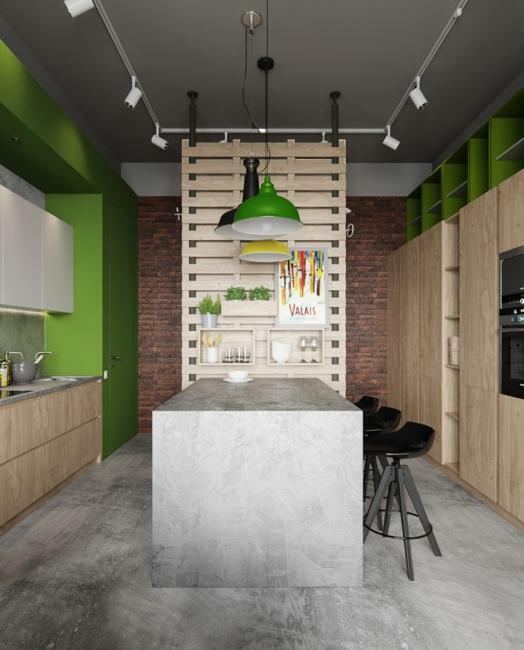 Concrete kitchen island design features a fridge and a wine cooler. 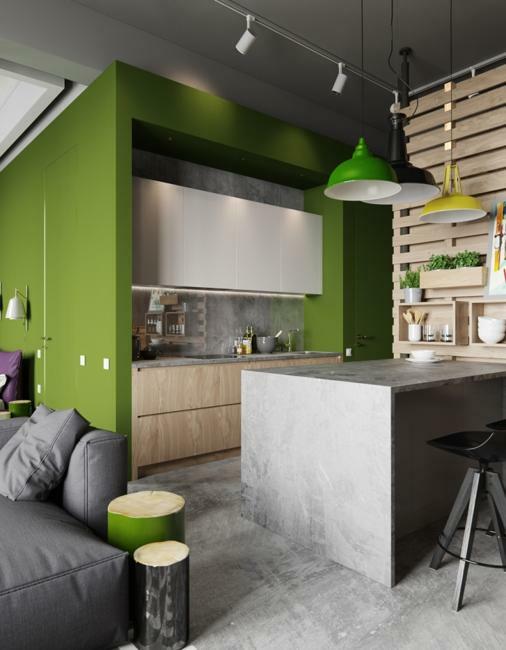 Comfortable and inviting, the small kitchen design is enhanced by adding accents in bright green color. 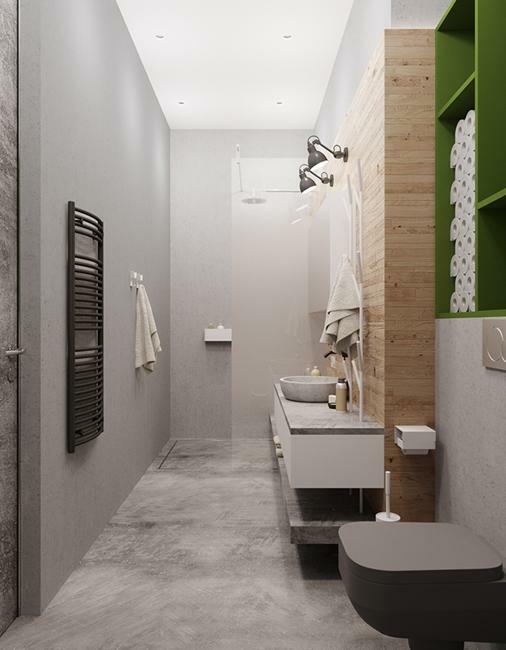 Concrete can be seen in the bathroom also. Natural wood and floor carpets look great with concrete elements, creating warm and cozy atmosphere. The living room design features a bio fireplace that reminds of warmth and welcoming atmosphere of Alpine chalets. 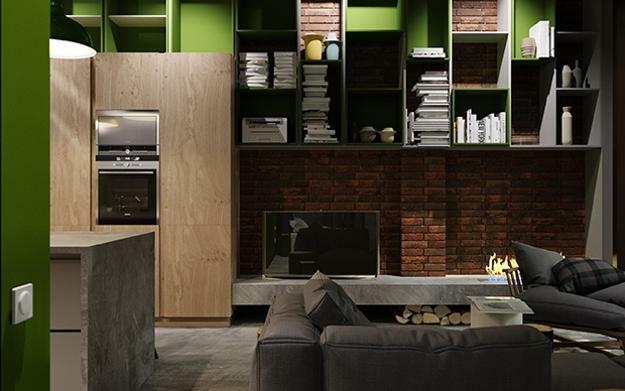 Wooden stumps create a connection with firewood for the fireplace, and make the interior design feel familiar and inviting. The bedroom is created with a glass partition wall to create a spacious and open look. Long curtains improves the open plan interior design and create an intimate atmosphere. 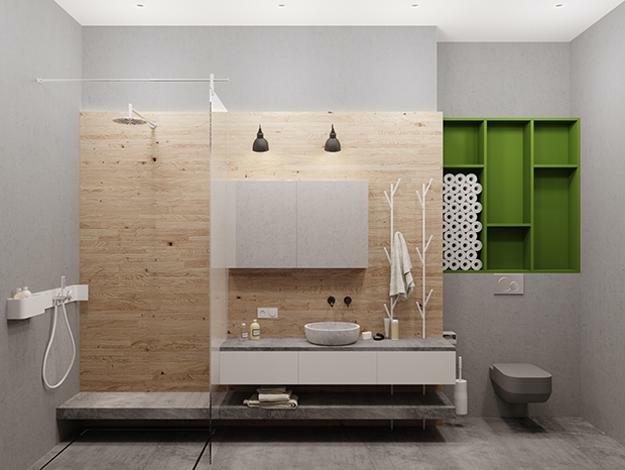 The modern bathroom is designed with granite and wood, combined with interesting decorating materials that imitate concrete surfaces. 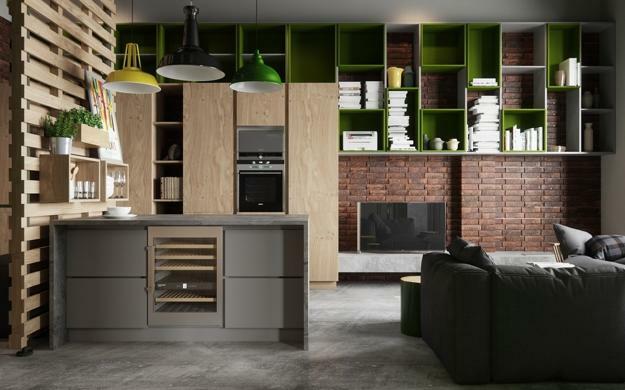 Modular shelving systems and space saving ideas are skillfully blended with elements of industrial style, and create modern interior design which feels open, comfortable and creative.